A special Thank you to Walker Books for sending me this book to review. Still reeling from her terrifying confrontation with the Magister and her brother’s betrayal, Tessa Gray is drawn ever deeper into the Shadowhunter’s dark underworld of demons and danger. In a desperate attempt to help her friends, Tessa tries to uncover the truth about the Magister and learns that he blames the Shadowhunters for the murder of his parents nearly a half century ago. But who were his parents, and why did the Shadowhunters kill them? Determined to unravel the secrets of his past, Tessa, Will and Jem journey to mist-shrouded Yorkshire, only to encounter corrupt Shadowhunters more intent on burying the past than finding the Magister – a past that holds the key not only to the enemy's motivations and weakness, but to the secret of what Tessa really is and what she was born to do. Meanwhile, Tessa’s feelings for Jem and Will are growing more complicated, and soon she is forced to acknowledge that any choice she makes will either save the Shadowhunters of London – or end them for ever. I knew this was going to be amazing, and I wanted to enjoy every single page. Boy did I ever! I don't know how Cassandra Clare has created such an amazing world, but it is truly in a class of its own. Pure brilliance! We left Clockwork Angel with Will having asked Tessa to be his mistress. I hated him for that. I knew he loved her but why oh why was he being such a jerk all the time?! Well, we find out in Clockwork Prince and let me tell you...my heart broke for Will. We definitely get to know Will better and Jem becomes a shining star. I liked Jem in Clockwork Angel but I LOVE him in CP. He is so much more than meets the eye. Tessa also comes into her own. She learns more about herself and how to deal with her powers and how she can be of use. But, WHAT is she? Let me just tell you that the love triangle is the best I've probably ever read. Author Cassandra Clare has got it right! She has made both men worthy of Tessa's affection, and have won all of our hearts. But who will Tessa choose? Who will YOU choose? I can't make up my mind. I love both Will and Jem for different reasons and I can't decide whom I like better. I can't decide whom I think is better for Tessa! This series is just Amazing! There are so many twists and turn to keep you guessing along the way and the characters are always surprising me. Not to mention how much I love this time period! 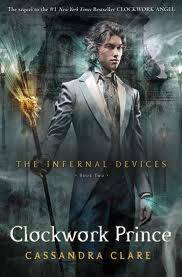 If you haven't read Clockwork Angel or The Mortal Instruments series, then you need to jump on the band wagon. You'll be surprised at how amazing these series truly are. You'll become a fan! I know I am! "Will has always been the brighter burning star, the one to catch attention — but Jem is a steady flame, unwavering and honest. He could make you happy."